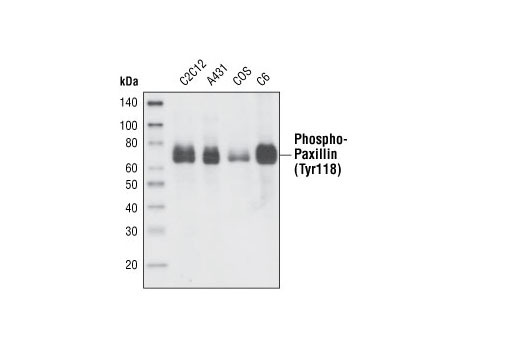 Western blot analysis of untreated and lambda-phosphatase treated COS cells, using Phospho-Paxillin (Tyr118) Antibody (left) and Paxillin Antibody #2542 (right). Western blot analysis of extracts from various cell lines using Phospho-Paxillin (Tyr118) Antibody. Confocal immunofluorescent analysis of Hela cells -/+ lambda phosphatase labeled with Phospho-Paxillin (Tyr118) Antibody (green). 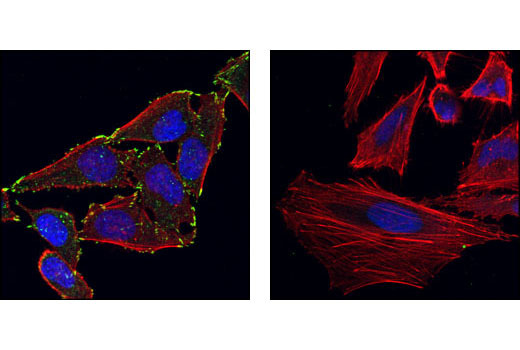 Note the robust signal in the untreated cells (left) versus the lambda phosphatase treated cells (right). Blue pseudocolor = DRAQ5™ (fluorescent DNA dye). Red = phalloidin555. 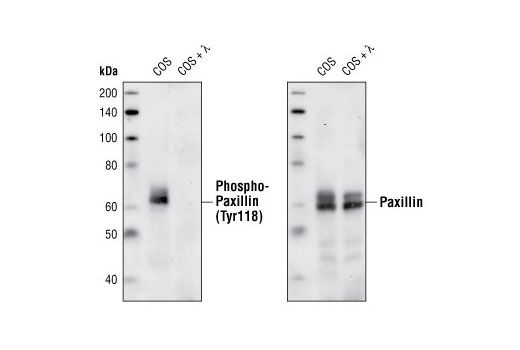 Phospho-Paxillin (Tyr118) Antibody detects endogenous levels of paxillin only when phosphorylated at tyrosine 118. The antibody does not cross-react with other tyrosine phosphorylated proteins. Polyclonal antibodies are produced by immunizing animals with a synthetic phosphopeptide corresponding to residues surrounding Tyr118 of human paxillin. Antibodies are purified by protein A and peptide affinity chromatography. Paxillin is a multidomain protein that localizes primarily to focal adhesion sites in the extracellular matrix (1). Paxillin is one of the key components of integrin signaling, and tyrosine phosphorylation of paxillin is required for integrin-mediated cytoskeletal reorganization (2). Paxillin is phosphorylated by another focal adhesion component, focal adhesion kinase (FAK), at Tyr118 (3,4). Phospho-Paxillin (Tyr118) may provide a docking site for recruitment of other signaling molecules to focal adhesions. It has been shown that the SH2 domain of Crk binds to the phosphorylated Tyr118 of paxillin (5). Schaller, M.D. and Parsons, J.T. (1995) Mol Cell Biol 15, 2635-45.